Our earthy green boho-chic stretch bracelet is a true reflection of nature and Our PachaMama. Eco-Chic and Eco-Friendly. Tagua nut slices are LIGHTWEIGHT and COMFORTABLE. *All pieces are one-of-a-kind and color and shape variations are normal. 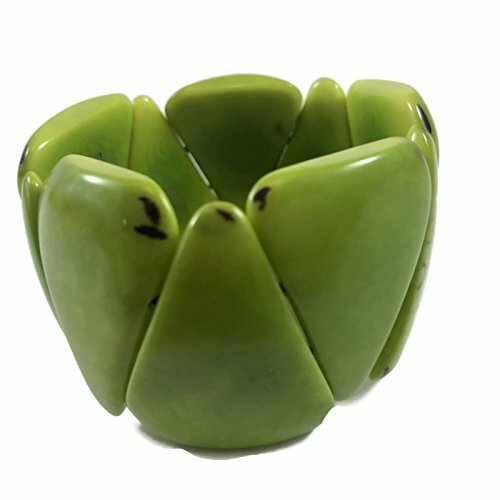 *Tagua is a Palm tree which grows in the hills and foothills (cloud forests) of the western Ecuadorian Andes. From this Palm, several clusters of nuts are produced annually. When the ripe clusters fall to the ground, the seeds are collected and allowed to dry. After they become hard, they are ready to be cut into different shapes and colored with vegetable dye. The Tagua nut is also known as "vegetable ivory" because it is a great alternative to elephant ivory. If you have any questions about this product by Our PachaMama, contact us by completing and submitting the form below. If you are looking for a specif part number, please include it with your message.